I haven't read much Attic poetry, so maybe the premise of this question is defective. But I'll ask it anyway. How did ordinary Athenians understand the tragedies when they used such different vocabulary? I don't imagine they had too much difficulty with the dialogue. The lyrics are a different matter (being so very unprosaic in language and imagery, not to mention in a foreign dialect and all), and the same question applies to dithyrambs and such. Of course, you have to wonder how many "ordinary" Athenians attended, but the Dionysia were no elite affair. So the question's a very valid one, it seems to me. 1) They were native speakers and despite massive increases in what we know of colloquial Greek we still, obviously, don't know enough about lexicon, minimal pairs, pace etc to always pinpoint difficulties. However I don't think they're that difficult. 2) Linguistics, especially neuroscience, has shown quite well that you don't need all the words to understand the meaning of a sentence, 95% comprehension, plus acting, would enable you to do fine. 3) The most important stuff from fieldwork tends to indicate that audiences were very diverse. Not just in terms of intelligence but how "practised" they were in their conventions, people who have went to many performances would be more competent. However, as I said, you don't need all of it to understand. And so on, you can develop that and pull in ethnographic stuff and specific studies of Athenian tragic audiences but that's the gist of it I feel. Is there another culture with different vocabulary for drama? How much of a difference is there for Latin stuff? Any culture with a performative tradition, whether it be epic, lyric, drama and so on yes. So Sanskrit drama was quite performative but made use of some pretty hefty, often ambiguous, compounds which would require repeated viewings/readings to get. As for Latin, well most forms are fragmentary or much later and highly influenced by rhetorical theory (which is another important, related, area) except for comedy. There are differences between Plautus (yei) and Terrence (boo!) but generally, yes, its understandable and colloquial in register, even the so called farce things. You know, from Atellan farces. Or rather, it all was in its day. Its not so much a different vocabulary just for drama, but register within the language and ones relationship to the literary/performance culture. if you just turned up now and then you're unlikely to get a lot. If you've served in a khoros or had Solon drilled into you in a symposia you'd get a fair amount. If you were a lucky aristocrat brought up on Homer, maybe you've had a Pindar or a Bacchylides sing for your or your family member's victory and you've travelled and know several dialects etc you're likely to find it all very easy, if you're family with the boisterous format that is. Comprehension is a very diverse thing. Shakespeare, after all, can be presented on the stage quite effectively to modern audiences, even if they don't catch every word. I think the "Doric" choruses are really written not in any language actually spoken in a Doric-speaking area, but in a stylized, superficially Doricized Attic-Ionic literary dialect, with a few key differences to mark Doricity--long alpha for eta, of course, Doric futures, and a few others. And if you had been attending choral performances in "Doric" from at least adolescence if not childhood, you probably wouldn't have too much difficulty with the choruses. Interesting discussion. And fastpaced--I go away for a couple of hours and find all this! I wouldn't quarrel with much in the above posts (a few details, perhaps: no-one would have much difficulty with Solon, surely? ), but I don't think we can sweep the problem under the carpet. The lyrics were written to be understood, and not all the performance factors will have aided comprehension (sung choral delivery, however well-trained? ?—and the pace must have been fast at times), and these are not ordinary sentences but stylistically elevated, often with convoluted sentence structure and unusual syntax: many barriers to overcome to achieve 95% comprehension. On the other hand, yes it's conventional literary doric not strong or real doric, thoroughly integrated within Athenian performance culture. And familiarity will have come not just through attendance but through actual participation, from a young age. Just think how many were involved in dithyrambic choruses! Cultural environment (in a mainly oral culture) all-important. I picked Solon simply because he was Athenian, but I meant that any Athenian of means and in an urban setting would be familiar with forms of lyric and elegy - look at the anecdote with Solon entranced by his nephew singing Sappho and we have Kritias' monstrosities as a perfect example of Athenian culture. Essentially, it wouldn't be alien. As for participation yeah I kind of mentioned that but it certainly is worth re-stating strongly: having a lot of people each year competing in khoroi gives you a reasonable pool of people at anyone time very familiar with the conventions of the genre(s). This is kind of what made Athens, with its proliferation of khoroi, different from elsewhere. I'm intrigued by what MWH brings up with pace. I'm a huge fan of appreciating metrics through Greek music theory and it can get pretty weird and I'd love to know how comprehension changed when we get to new music influenced Tragedies. They did get more complex so one would think people began to have trouble...especially if the display got more and more bombastic. I, frankly, have trouble following some modern English plays. Bloody lunatics these actors. But, its hard to assess simply because oral cultures are so varied. I'm personally fascinated by examples where the audience explicitly doesn't understand what's being said, though obviously this isn't the case in Athens, we've quite a few examples from Africa. Clearly we're all on the same page here. Evidence for pace - excited flurries of short syllables and such. The thing about the New Music is that the music mattered more and the words less. The music:rhythm:words correlation shifts, and comprehension comes more from the expressiveness of the music and instrumentation. Say Scribo, has anyone ever told you that you have an amazing knowledge of the classics? But really, your posts always astonish me .. Same kinda goes for some others here, it's amazing! I wish I could say half of the stuff you said on this, but unfortunately, I can't! Bah just voraciously swallowing the research of others and not really contributing tbh, though I do have an especial interest in performance theory and ethnography. In an ideal world I'd be allowed to travel and record just like Parry, Lord, Finnegan, Notopoulos and so many others did. I'd love to go to Mongolia. Anyway thanks for the compliment but its just passion. MWH: That makes sense, thanks. I don't really know much about new music. I mean I understand some of musical theory and the obvious social criticism but I really know next to nothing, I've read Timotheus and some of the later Euripides but...well as I keep saying, in general drama is not my forte at all. I expect you know West's Ancient Greek Music, which makes things so much more accessible. There's good Italian stuff on the new dithyramb too. 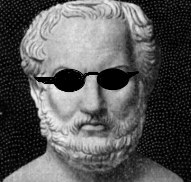 But if you despise Euripides for wimpyness (you don't hide your passion, do you?) you would really hate the new music. What we really need is Aristoxenus' Rhythmics. That would be a real game-changer. Ha, I'll admit I'm not a massive fan of Euripides but I guess its an extended joke. I really do believe in the whole...you know, respectful, impartial, judgement on the work of another culture and all that I guess it started as a sort of joke against the kind of overweening aesthetic judgements you see. To be fair, its probably not funny to anyone besides myself and I probably run the risk of seeming a bit mental. Aaah if we start to catalogue the stuff we need, tears will soon follow. I have a list of stuff I'd love to have more of...or just plain have! I swear fragments are a blessing and a curse. My friends used to joke my love of working with fragments was a perversity and I dare say they're probably right. There is something amazing in "Sherlockismus" even if at times you kind of think...wait what the hell am I saying? As someone who works on fragments I'd never accept the charge of perversity - except from myself. The only trouble with eliminating the impossible is that what remains is ... hundreds of possibilities. Or when you build castles out of the air like oh this fragment of the Kypria seems to be exhibiting....Atticisms? neuters in os, ample correption...seems different from Ionian practice. Oh Helen is Nemesis' daughter here? oh well clearly this was performed at the Attic festival up at Ramnous...no...Scribo stop it. That's when you put it down and ban yourself from reading anything written in German for a week. I'm resisting the temptation to make a couple of jokes. I'll troll others' threads, but I should draw the line at my own! EDIT: Not as snazzy and hope I'm not intruding, wonderful trend idea though. Intruding? Nah. Gets kind of bright down here on the Aegean. Instead of trolls though we're Telkhines. Watch out Callimachus, we're coming for you with our mega....biblia. What I'd like to know is what does a blind poet need with sunglasses? mwh wrote: What I'd like to know is what does a blind poet need with sunglasses? Where you just setting up your joke? Or should we get Stevie Wonder on the phone? You'll have to make them more esoteric if you want to catch up with Scribo. mwh wrote: I don't imagine they had too much difficulty with the dialogue. Which tragedies have the easiest, ie most prose-like, dialogue? More generally, which Attic poems are the easiest? Which tragedies have the easiest, ie most prose-like, dialogue? You might try Medea. In my experience, Euripides is generally less difficult than the others. But I wouldn't say the language is necessarily prose-like. There's a good Cambridge Green & Yellow series edition of this play by Mastronarde--yes, I know, you've expressed your dislike for Mastronarde's textbook elsewhere. But whatever you read, you'll need to equip yourself with a good commentary, and his is up-to-date and thorough. You can't just pick up the text of a tragedy and expect to read it as you would an English text. David Kovacs has produced an excellent new Loeb series of Euripides, but your experience of working through a tragedy will really be enormously enriched and enhanced if you use a modern commentary, with help on the grammar and lots of background information. Tragedy, by the way, isn't composed in the Attic dialect. The dialogue is Ionic and the choruses are Doric. There really isn't much poetry in the Attic dialect, except perhaps the dialogues of Aristophanes. There was no genre of poetry associated with Attic, and even Solon wrote verse in the Ionic dialect. However, the Ionic and Doric of Athenian tragedy are really not too different from Attic, with an Ionic or Doric veneer that you'll get used to quickly.